A Homemade Gift Idea that Even YOU Would Love to Receive! Giving homemade gifts can be a bit tricky. 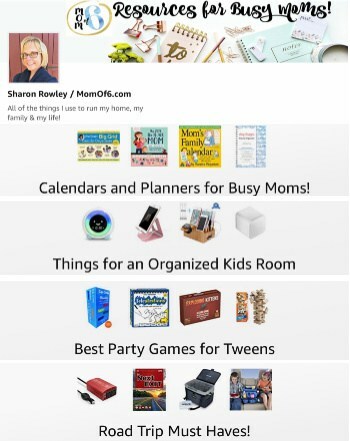 You want to make and to give something that shows how much you care, you want to stretch your budget and be able to give something nice that doesn't cost a lot, but at the same time- you want to give a gift that doesn't really look…. well- homemade! Or at least not homemade by a pre-schooler! So the past few years I have given a gift that combines something yummy with a pretty way to present the yummy treat that can be kept by the recipient. Two years ago I created glass-etched bowls and filled them with holiday candy…. last year I made glass-etched plates and filled them with holiday cookies. But this year I think I came up with something a bit simpler and just as lovely (or so I hope)…. 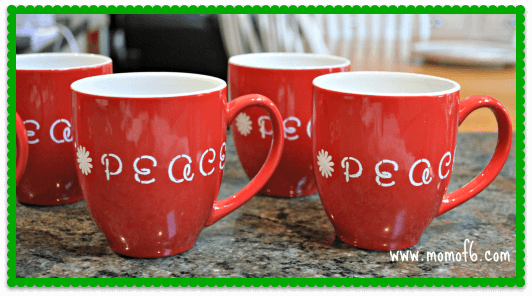 hand-stenciled mugs filled with peppermint bark! 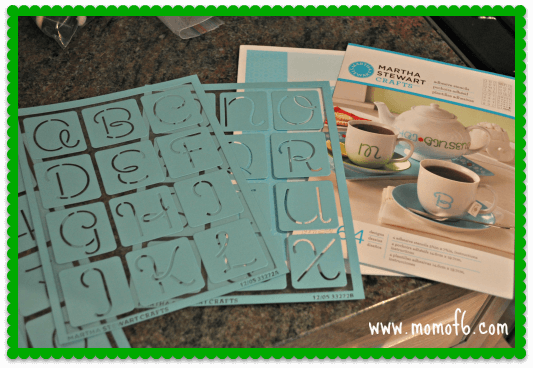 I purchased two cases of blank mugs online from BargainMugs, and a Martha Stewart stencil kit that allows you to apply the stencil, paint over it, and then easily remove it, wash it, and use it again! 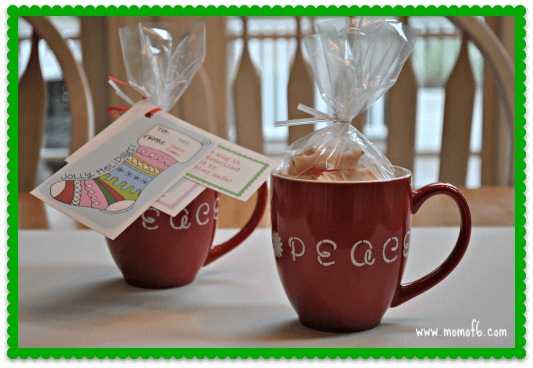 I decided that I wanted to paint the word “peace” on my mugs, as that word represents both what I wish for the person to whom I am giving the gift, but also because it is a mantra that I am trying to keep close to my heart. The entire process was fairly simple to do. 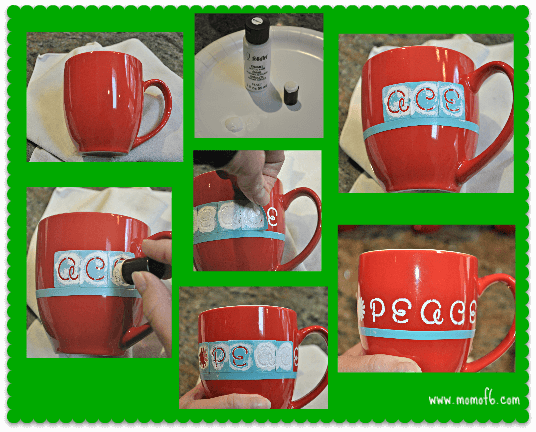 I used a strip of the stencil page to create a straight line on my mug which I used as a guide when applying my letters. I started near the handle and applied my letters for “peace” backwards… first the “e”, then the “c”, and then the ‘a”. But uh oh, I needed another “e'” and the stencil kit only came with one of each letter! So I applied the paint using a sponge dauber to these three letters first, and then I carefully peeled away my “e” stencil. I then washed and dried it before applying it to the mug again, followed by the “p” and the small flower. I then applied the paint to the rest of the word, allowed it to dry for a few minutes and then peeled away all of the stencils. I was able to hand-stencil all 24 mugs in just a few hours. Next, I wanted to fill them with a delicious homemade treat- so I settled on one of my favorite holiday recipes- peppermint bark. 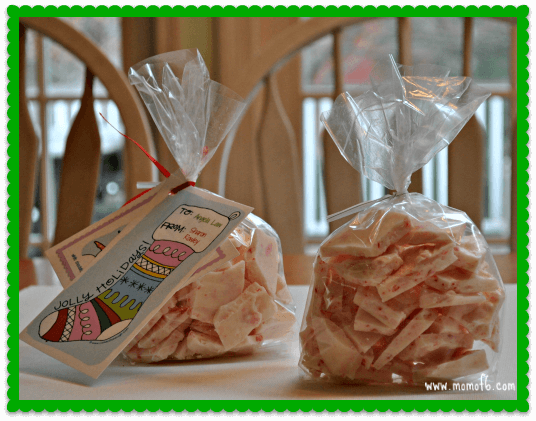 It is simple to make, and a single batch can fill about 6 goodie bags. 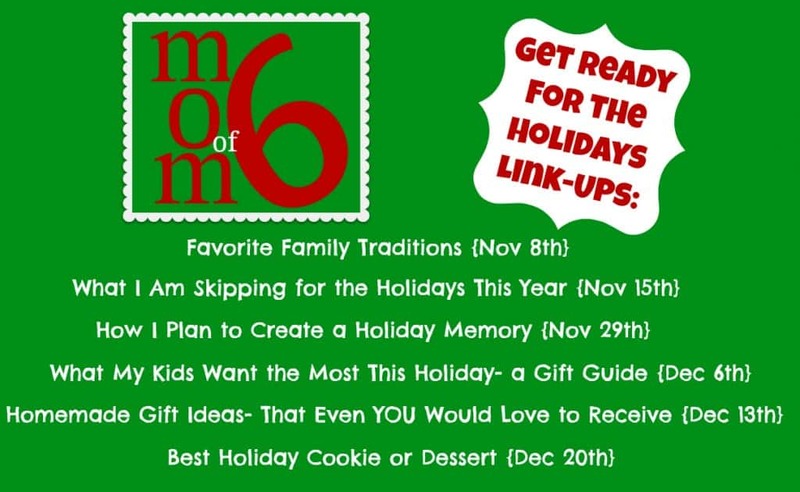 You can find my recipe for peppermint bark here! And finally I added these sweet gift tags. 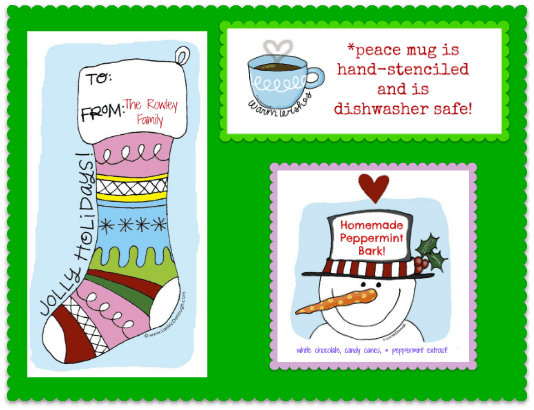 I found the artwork for these free printable Christmas tags over at Fresh Picked Whimsy, and I simply uploaded the file into PicMonkey and added my own information to it before printing the tags! 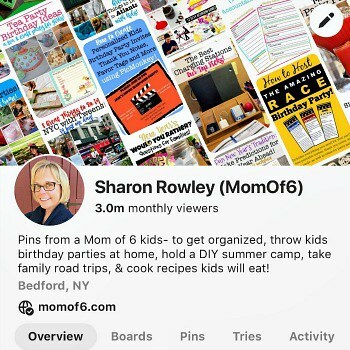 Are you making any homemade gifts this holiday season? I would love to hear about it! 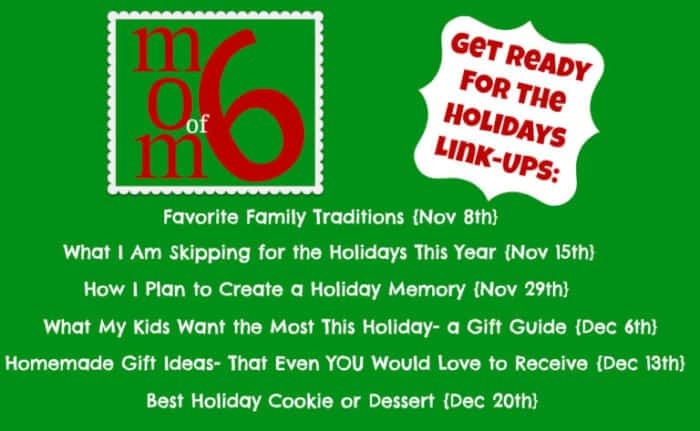 Please leave a comment here below, or link up if you've decided to join me for our Getting Ready for the Holidays “Blog Party”! 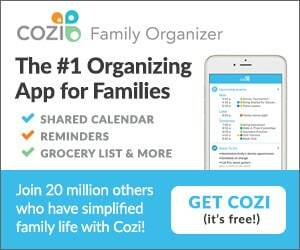 « Holiday Gift Idea: for the Young Builder in Your Life! Thank you Sharon, I think it will mean a lot more to him than the cash I am including for both of them. To make a long story short my mom died the summer of 2011 while my step-dad was in Ohio trying to find a place for them to move, etc. My brother threw everything out before I could get to him (different states) including all of their old Christmas ornaments. I know my step-dad misses her so this year I decided to do something in my moms style for him. I made a cotton ball Christmas tree (styrofoam balls with cotton balls glued onto it and glitter for decorations), and a glitter tree (styrofoam ball with embossers green glitter and sequins pinned to it in various spots). It won’t bring my mom back to him, but I’m hoping it gives him some peace. I started making giant flat santa hats for the center of the dining table using felt, metallic thread, buttons, sequins, etc; but I don’t know if I will have them ready in time (we must embelish *L*), so that may just be next years present. As you know in a house as big as both of ours, it is never to early to shop/make presents for Christmas. 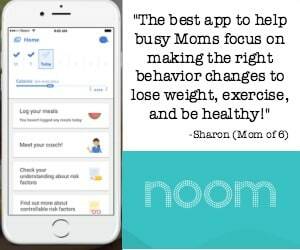 Erica- I am so sorry to hear about your Mom. And I think that what you are doing for your step Dad is such a beautiful thing- to give him something in your Mom’s style. I am sure that it will mean so very much to him. Thanks so much for sharing that today. To me, this is what embodies the spirit of the Christmas season.